WHAT: It started as a fun way to have a birthday party and now has grown into a yearly tradition. We run a Charity Dodgeball tournament (proceeds going towards The Alzheimer’s Society of Toronto) with a post tournament pub party. 6-8 teams will compete (in costume) for the coveted BuddCup, which is currently in the possession of last years winners “Johnny In-Deppths”. Post game drinks: 4:30pm onward at Scallywags. TOURNAMENT: The Timothy Eaton Church at 230 St. Clair Ave West. Located 2 blocks west of Avenue road, the tournament will take place in the Flora McCrea Auditorium located on the east side of the church property, approximately around 18 Dunvegan. Here’s the link to the google streetview. POST GAME PARTY: Drinks, Food, Ping Pong. Scallywags rooftop. (11 Saint Clair Avenue West). COST:: $30 and at least one canned food item, to be collected at registration for the tournament. PRIZES: Prizes are awarded for the winning team, team with best team costume, best individual costume (male and female), and best spirit. DRAW/SILENT AUCTION: We’ll be having our yearly draw and silent auction, stay tuned to hear what awesome prizes you can bid on or win. TEAMS: As in previous years, we’ve chosen team captains (with a lot of dodgeball experience) to head one of the 6-8 teams that will compete in the cup. The tournament will be ‘self-officiated’, where each team (and team captain) are responsible for making sure that their own team plays by the rules. We’re currently not allowing entrants to make their own teams, but will allow entrants to request to be kept together in groups of 2 (possibly 3) maximum (preferably in pairs). That way, when we draft players to different teams, we’ll be doing our best to ensure that no one team is ‘stacked’ with ringers. 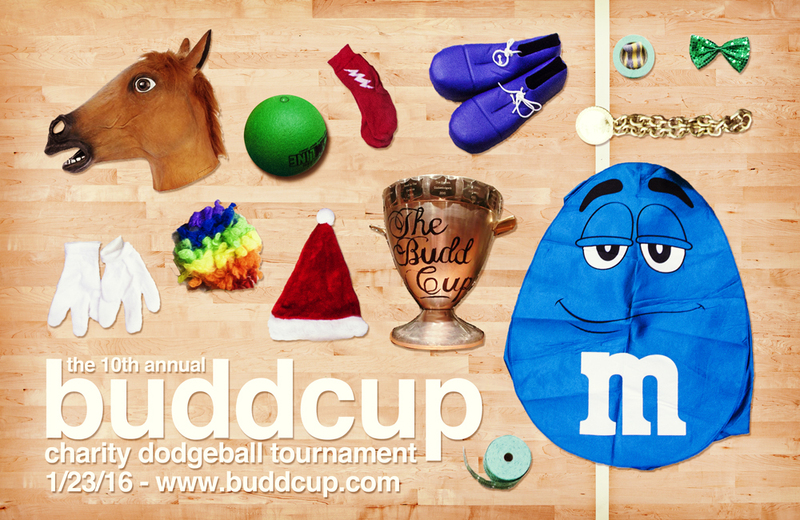 CHARITY: This year, the proceeds of the BuddCup will go to The Alzheimer’s Society Of Toronto by way of sponsoring our “Eat Dessert First” Walk For Memories Team. The Walk for Memories is a 2.2km indoor walk through the underground PATH of downtown Toronto, beginning and ending in Brookfield Place. The event brings together over 1,500 individuals who have been touched by Alzheimer’s disease and other dementias. INVITING FRIENDS: This is a private event, but WE’D LOVE TO HAVE YOU BRING YOUR FRIENDS to the tournament. To make sure they get all the info, please forward the e-mail you received from us with all the event info, or ask them to sign up here to stay updated. This year (like the last few), THERE WILL NOT BE A FACEBOOK EVENT, we’ll be running the tournament through this website and e-mail communication. **NEW** SKILLS COMPETITION: We’re always trying to make this tournament more and more fun every year, so this year we’ve decided to try incorporating a skills tournament. We’ve bought a radar gun to measure the fastest throw and we’re currently conceptualizing how we’ll run a throwing accuracy competition, a dodging gauntlet and possibly a one-on-one showdown mini-tournament. SIGN UP PROCESS: This is the only way you can register. DEADLINE FOR SIGNING UP IS JAN 15th at midnight. WHAT TO BRING: Bring non marking shoes, a costume you can move easily in, one canned food item, registration $ (sorry, no debit or credit), cameras, water bottles. If you plan on going straight to the after-party from the event, bring a change of clothes. SUPPORTING THE EVENT: There’s a variety of ways you can help us raise money at this event. Join a team to compete in the event. If you’re not into playing dodgeball (or dressing up), please come to the tournament to watch, or meet us at the bar afterwards. Finally, you can also donate online here.